Although the Grand Eagle Casino has a very “All American” appeal, this gambling site actually offers a lot of great options for international punters. Online gamblers can choose from a full variety of game options including Classic Slots, Video Slots, Table Games (Blackjack, Poker, and more), Video Pokers, Keno, and more. Overall, Grand Eagle Casino has a lot of things going on. First of all, you’ll get a great variety of casino games including the classics along with more innovative Video Slots. The banking options can get a little limited, but they do treat their customers really well. If you haven’t tried BetOnSoft gaming software, this is a great place to start. The best part of this online casino is the Genesys rewards program that allows gamblers to redeem prizes like trips to exotic locations, spa treatments, dining points, and more. Powered by BetOnSoft casino software, Grand Eagle Casino games has the basic package of both traditional as well as more sophisticated options. 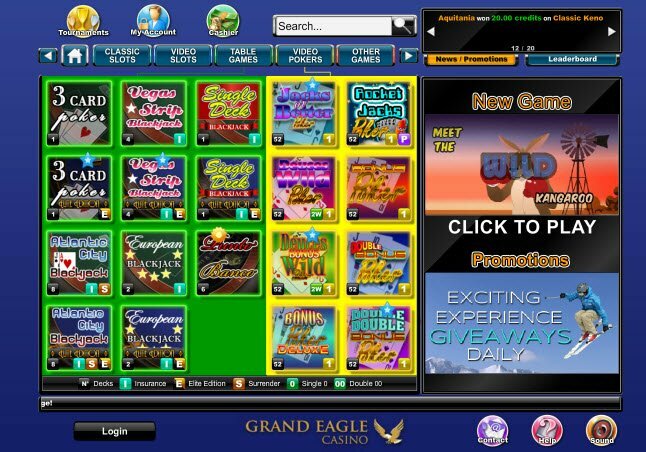 The Grand Eagle Casino software definitely caters to Americans with its red, white, and blue site, blue casino interface, and eagle emblem. However, not only Americans can enjoy their large choice of games which include (but not limited to) Classic Slots, Video Slots, Table Games (Blackjack, Poker, and more), Video Pokers, Keno, Scratch Cards, Tournaments, Jackpots, and more. There’s definitely enough options to satisfy all casino players. As a member of the Genesys Loyalty Club, players can redeem particularly exciting prizes as they accumulate points. Choices include plane ride tours, cars, boats, spa treatments, dining, water sports, dance class, and travel rewards. Grand Eagle Casino promotions include packages starting from the moment you sign up. New Players receive a 100% match on their first deposit up to $250. The promotions don’t end after signing up either (as is the case with some casinos). 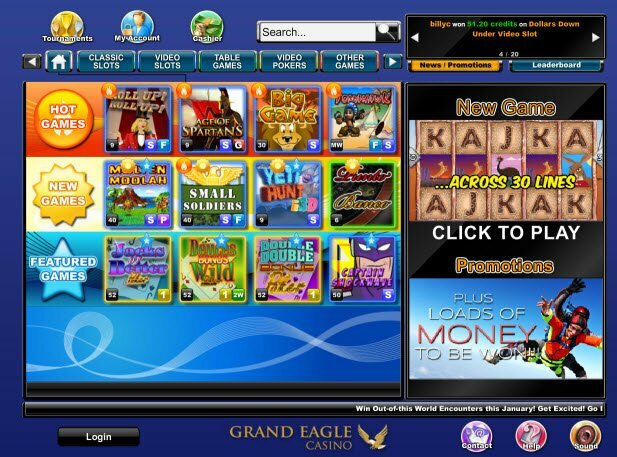 Grand Eagle Casino bonuses also rewards players with generous weekly offers such as deposit bonuses and free spins. On top of all of this, loyal members will gain access to the Genesys Club Loyalty Program. With the Genesys Loyalty Club, players can redeem particularly exciting prizes as they accumulate points. Choices include plane ride tours, cars, boats, spa treatments, dining, water sports, dance class, and travel rewards. Most online casinos simply cannot compare to this number and variety of interesting prize packages. Sometimes when it comes to casino payment methods, less is more. In other words, it’s better when a casino accepts a short list of reputable and safe deposit methods rather than many lesser known banking systems. Such is the case with Grand Eagle Casino. Canadians have a number of credit cards, debit cards, and eWallet systems that they may use to place real money bets. Although Grand Eagle Casino has a very North American look and feel, they do not exclude international customers. Those placing deposits from Europe have a variety of choices from credit to debit cards, eWallets and bank transfers. Unfortunately, players from the United States may use Visa Credit and Debit Cards as well as Pre-paid Visa or gift cards. Many expect options for Americans to improve across all gambling sites as the industry becomes legal in more States with time. Grand Eagle Casino gets it right when it comes to customer service. If you have any questions or issues while playing, you can quickly get in touch with a staff member via the gambling site’s Live Chat interface. When I entered a Live Chat session, a customer service rep named Cathy C quickly answered my questions. They even go the extra mile for new users. 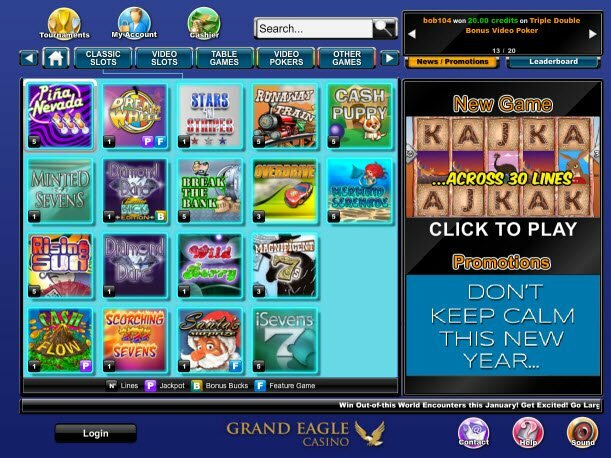 Upon entering the casino interface, Grand Eagle provides players with a step by step tutorial to help get new players started. It’s nice that the casino developers took their customers into consideration by giving them a tour through the casino.